Translation from your native language is usually something to be avoided when learning a foreign language. If you construct sentences in your native language first, then translate them into Chinese, the process will often be slow and the result not so idiomatic. The goal should be to form the sentences in Chinese, without going through another language first. This is not easily achieved, though, and beginners and lower intermediate students are stuck with translation before they internalise common words and basic grammar. In this article, I will discuss how to approach translation from your native language to Chinese. The bulk of the article is aimed at beginner and lower intermediate students. More advanced students probably don’t need such an elaborate process, but can construct sentences directly in Chinese. If you struggle with that, this article is for you. For more about translation in general, check out my other article about this topic, which also includes some exercises that work well for advanced students. I have taught many courses that include translation in some form. In my experience, the biggest problem for beginners is word order and grammar, which is the focus of this article. Beginners learn the building blocks from the textbook, but when asked to use these for translation, they stay too close to the English original and forget most of what they’ve learnt about Chinese syntax. As the students become more advanced, word order can still be a problem, but word usage and collocations are likely to become more important. Getting that right when translating is mostly a matter of being able to look up words in a dictionary the right way, which is surprisingly hard. In short, the method I present here is meant to avoid writing English sentences with Chinese characters and instead urges you to first go down to the basic meaning of the sentence, then express that meaning in Chinese. The whole process looks like this, but don’t be scared if it looks confusing; I will go through each step below! Long and complex sentences are obviously harder to translate than short and simple ones. If necessary, convert the sentence you’re about to translate into several easier parts that can be translated separately. Please note that this is not limited to splitting a long sentence into clauses; it could also be isolating a tricky component of a sentence and translating that separately. Example: The sentence The apples I bought yesterday are very tasty contains two clauses: The apples I bought yesterday (or possibly I bought apples yesterday) and X is very tasty. Figure out how to say each of those separately first since this is much easier. 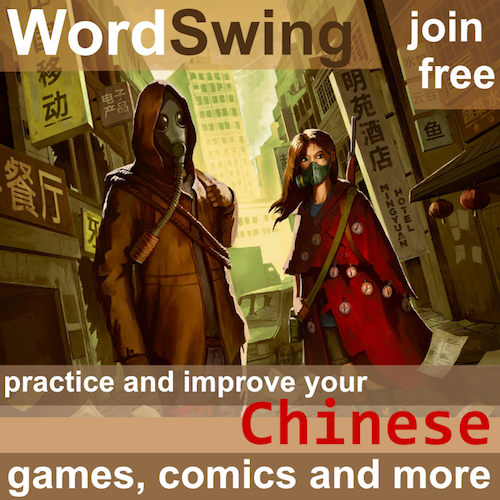 Strip away any grammar words, inflections and non-literal expressions. If there are indirect or non-literal ways of expressing something, replace these expressions with something that simple states what they mean (e.g. if the original contains the expression hit the sack, just write go to sleep since this is completely unrelated to either sacks or hitting). The result should be a sentence that mostly means the same thing as the original, but is expressed in the most simple way. Example: The apples I bought yesterday are very tasty is reduced to [apple I buy yesterday], and [X is very tasty]. These versions are understandable and mean mostly the same thing as the original, but are much simpler. The next step is to translate these words individually, while staying aware of context. The problem is that most students stop here and say/write whatever the result is. Instead, think of this as no longer being a sentence; your goal should be to have a bunch of Chinese words you can use to write a new sentence. 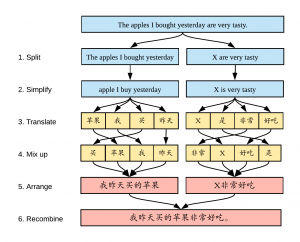 Example: [apple I buy yesterday] would turn into [苹果 (蘋果)、我、买 (買)、昨天], and [X is very tasty] would turn into [X、是、非常、好吃]. 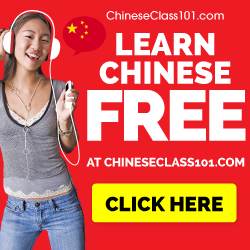 While it’s true that the basic word order is the same in Chinese and English (Subject-Verb-Object, SVO), anyone who has studied just a little bit of Mandarin knows that word order in general is almost never that easy. To avoid inadvertently keeping structures from the original English, mix up the order of the words you have. This forces you to evaluate the position of each word, rather than just keeping the order because that’s the way you would say it in English. You can do this by writing them on small pieces of paper, haphazardly writing them in a list or any other method you can come up with. To make the process more efficient once you’ve mastered it, you can of course mix up the words immediately when translating them in the previous step, effectively combining the two steps. Example: Here, I will just list the words in random order: [买 (買)、苹果 (蘋果)、我、昨天] and for the second part [非常 、X、好吃、是]. The next step is to use what you know about Chinese grammar and combine the words to express the meaning of the original sentence. For more about learning grammar, check this article by John Pasden. As a general grammar reference, the Chinese Grammar Wiki is very useful. When performing this step, try to think of the situation the original sentence described, rather than the exact words used. This is also the step where you fix any problems with word choice. For example, it might be that a certain verb is used in English but not in Chinese (in English, to have lunch is idiomatic, but in Chinese you normally use eat instead, for instance), or that you need to insert an extra word somewhere to make it work (such as 了). Example: You have two things you want to describe and you have two sets of words to do it with. In the first case, you want to express who bought the apples and when; in the second part you want to express that they are tasty. 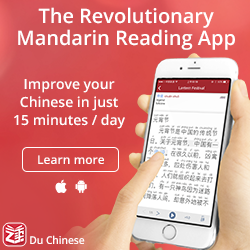 Here’s one way to do it: 我昨天买(買)的苹果(蘋果) and X非常好吃. Please note that this was done simply by rearranging the parts and by dropping 是, which is typically not used to link adjectives and nouns; the 非常 is enough. Step one was about removing complexity, so now it has to be added in again. This is simply a matter of inserting one piece of the translated text into the X in the other piece, or combining several pieces in some other way. Pay extra attention to higher-order grammar here, such as linking words between the pieces you have translated. Also check tenses or anything else you removed in the simplification step. Chinese does not have tenses as such, but the time when something happened can still be expressed, of course. Example: By inserting 我昨天买(買)的苹果(蘋果) into X非常好吃 you get 我昨天买(買)的苹果(蘋果)非常好吃. There doesn’t seem to be any higher-order grammar to worry about here, but if you incorrectly added 是, this would have been a good place to think about if that’s really the best way to link an adjective to a noun. This step is crucial, but often overlooked, probably because of time constraints or laziness. After you have produced a Chinese sentence, you have to read it and carefully compare it to the original sentence. Naturally, the two versions will not be the same in terms of vocabulary and word order, but they should mean the same thing. Comparing with the original is extra important when sitting an exam with translation questions. You don’t want to lose points just because you forgot to translate some important part of the original sentence. Since translating sentences is far from easy, it’s common to accidentally drop some part of the sentence in the process. Doing one final check will make sure the meaning is as intact as possible! Example: Let’s compare! Chinese sentence: 我昨天买(買)的苹果(蘋果)非常好吃. English original: The apples I bought yesterday are very tasty. Seems good to me; no missing parts here! Below, I have translated three more sentences using the above method. I suggest that you just read through the first example as a way of reinforcing the method, then try the second and/or third example yourself (the third one is considerably harder). If you need to look things up, do it properly. Note that after splitting the sentence, I’m translating the different parts in parallell, but you can and probably should do one part at a time. The reason I put them all together here is simply to avoid making the article unnecessarily long. To make it easier to read, I have only included simplified Chinese for the solutions. I often have lunch at the restaurant behind our school. My cat likes to lie on the TV because it’s warm there. I thought I would be able to get to the airport at three o’clock, but there was an unexpected traffic jam on the way, so I missed the flight. English original: I often have lunch at the restaurant behind our school. Compare: I often have lunch at the restaurant behind our school. English original: My cat likes to lie on the TV because it’s warm there. Compare: My cat likes to lie on the TV because it’s warm there. English original: I thought I would be able to get to the airport at three o’clock, but there was an unexpected traffic jam on the way, so I missed the flight. Compare: I thought I would be able to get to the airport at three o’clock, but there was an unexpected traffic jam on the way, so I missed the flight. I teach this translation method because it tends to produce much better results for students. 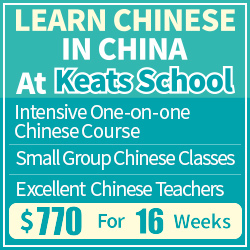 Naturally, it takes longer than just winging it or relying heavily on the original sentence, but that’s not good either for communicative purposes or for practising your Chinese. If you look at the process more carefully, you will see that what I’m actually doing here is encouraging the students to go down to a basic layer of meaning, then try to build a sentence in Chinese that expresses that meaning, without necessarily caring that much about the original structure and wording. This part of the translation is actually the same as speaking and writing Chinese normally, without a source sentence to translate! Thus, apart from generating better translations, I also believe that this kind of practice has a much bigger carryover to actual speaking and writing. Are you sure? The sentence has two finite verbs, so must have two clauses, mustn’t it? These are: ‘The apples are very tasty’ and ‘(that) I bought yesterday’. The split & simplification then becomes: ‘X (is) very tasty. I bought X yesterday’. Apart from this quibble, I think your method could be very useful. Yes, you’re perfectly right, of course. I have adjusted this part of the text. Thank you! Is the construction used in “我的猫喜欢趴在电视上，因为那儿很热。” common in formal written Chinese? I usually find myself trying to use “因为… 所以…” instead. A common way to explain causes in Chinese is with 因为 (yīnwèi). This is equivalent to “because” in English. Usually 因为 (yīnwèi) will begin a new phrase in a sentence. 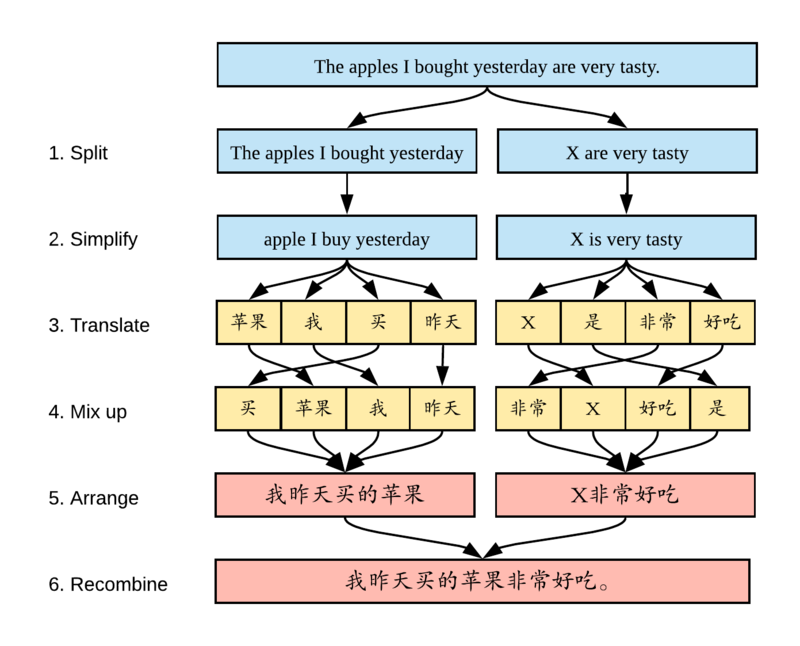 In this structure, we first state the result, and then give the reason in the next statement after the 因为 (yīnwèi). The full pattern 因为……所以…… (yīnwèi… suǒyǐ…) is used to clearly indicate cause and effect. They could be thought of as equating to: “Since ___ happened, so ___ happened.” It sounds weird to use both “since” and “so” in one sentence in English, but it makes everything crystal clear in Chinese.